We offer Dojo, Guru, and Sensei packages for most bootcamp locations. 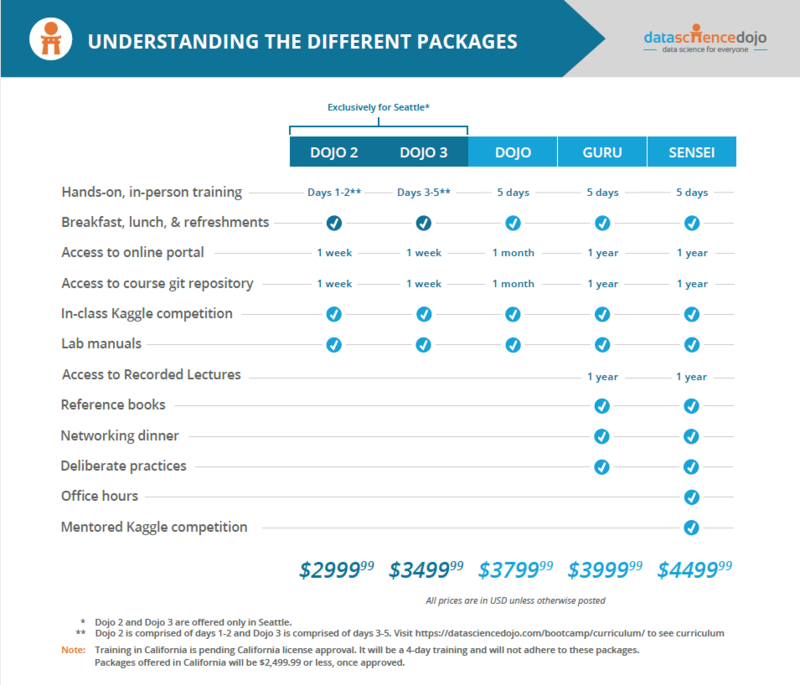 You can compare each package down below where we give specific details and pricing of what each package includes. Each package is announced at our early-bird discounted price of 30% off. Each discount tier has a limited number of seats and is available in limited quantities and on a first-come, first-served basis. Packages are shown at full price below. For Seattle, we offer Dojo2 (first two days), Dojo3 (last three days), Guru and Sensei. For Toronto, we offer 5 separate packages based on the curriculum taught each day. If you choose to purchase all 5 packages, you are eligible for an early-bird discount. You can view our Toronto package offerings, here. Please note, the California bootcamp, pending California licensure approval, will be a 4-day bootcamp, will not include the IoT project, and will not adhere to these packages. The package comparison will be updated to include California, once approved.